The U.S. military's sea-based missile defense system on Thursday showed it could intercept two targets simultaneously when it destroyed a cruise missile and a short-range ballistic missile during a test off the Hawaiian island of Kauai. 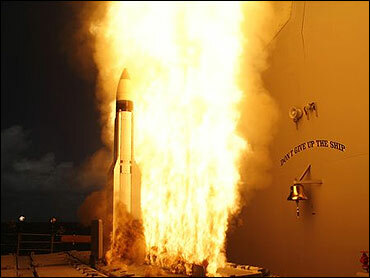 The test marked eight out of 10 times the Missile Defense Agency and U.S. Navy's Aegis ballistic missile defense system successfully intercepted targets. But it was the first time the system knocked out two targets at the same time. Rear Adm. Alan B. Hicks, commander and program director of Aegis ballistic missile defense, said after the test that the crew executed the mission flawlessly. "Every test we do we take a different approach to further stress the ship and the system," Hicks said by telephone from Kauai. This is to "give us confidence if we have to do this in the real world that we can do it," the admiral said. A similar attempt failed in December when the first interceptor missile, designed to collide with the ballistic missile target, failed to launch. The military later determined the ballistic missile defense system had been incorrectly programmed. The scenario for Thursday's test had the USS Lake Erie, a U.S. Pacific Fleet cruiser, learning that "hostile forces" were preparing to attack a friendly nation. The sailors were told to protect the allied country. Then the scenario called for the Lake Erie itself to come under attack from a cruise missile fired by an enemy plane. The Lake Erie fired both interceptor missiles from its on-board silos about one minute after the targets were launched. The military fired the short-range ballistic missile target from the Pacific Missile Range Facility on Kauai. A U.S. Navy plane fired the cruise missile target used in the test. Six warships in the U.S. Pacific Fleet are already equipped to track and shoot down ballistic missiles like the Lake Erie did. Another 10 have the ability to track ballistic missiles and will be installed with the intercept technology by 2009. Two Atlantic Fleet ships will also have both tracking and interception technology installed on board by early 2009. The military is focusing its Aegis missile defense technology in the Pacific because of North Korea's development of ballistic missiles and nuclear weapons. The U.S. has joined forces with its close ally Japan to develop a new nose cone for the Standard Missile-3 interceptor. Tokyo has been pouring energy into missile defense ever since North Korea test-fired a long-range missile over northern Japan in 1998.